Chassis reinforcement/ body rigidity modification isn't something that should be performed without careful thought. It all depends on different car models and their structure. Each car has a weakness and to pin point that is the key. This guide will show you the best chassis reinforcement for you car and specification. 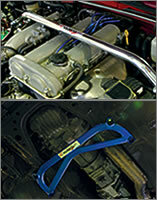 On a S13 or a S14, installing a strut tower bar or a floor bar is the first step taken to stiffen the chassis. But on a S15 Spec R, a different approach should be taken because this vehicle already comes with a rear trunk bar and a floor bar installed from the factory. Sunline Auto claims that on a street car equipped with high performance radial tires, installation of front and rear strut tower bars should be sufficient. However, if the car is going to be used at places other than the street, it may be worthwhile to perform further chassis enforcement. The predicament of not being able to control the car on an intended line may be because the front tires lose their grip due to the body flex. By installing a tension bracket brace or a triangle support bracket, the steering response increases with the front tire grip during cornering. The bolt on side bar kit is also recommended as well. This component helps bring stiffness evenly throughout the car if only one part of the chassis had been strengthened than the other. Sunline Auto also highly recommends urethane injection into the chassis as well. This deadens the road noise while providing rigidity. The first step is to strengthen the front by connecting the tension rod and the side frame with a C shaped bracket. This increases the vehicle response, and front tire grip during cornering. A roll cage wasn't really necessary because the car is only used at the tracks a few times a year. The suspension performance increases with the installation of the side bar kit which ties the seat belt bolting point to the frame. The first generation of these cars had a flexible chassis. During that era, the manufacturers did not make chassis rigidity a priority. But soon after, the tire manufacturers started to come out with high gripping tires, so the auto manufacturers started to stiffen the chassis in relation to them. On the S15 Spec R, front and rear stiffening bars were already included. This potential of the car is more than enough on the public roads with street tires. Sunline's S15 has a T78 turbo on a 2.2 liter engine, pushing 500 horsepower. This car clocked in at 1 min 35.8 seconds at the Okuyama Circuit. The body has been fully caged up and spot welded, plus urethane injection in the body. Any car that pushes 400 horses on race tires will require a significant amount of strengthening and support for the rear. This vehicle was used as the company demo car, sports a custom 16 point roll cage. Sunline Auto's Mr. Sato claims "having an overly rigid body doesn't mean a thing when the tires give up first. A 12, or even a 10 point cage is sufficient." The key is the use of a rear chassis reinforcement kit. The rear bars are applied to the wheel well areas. 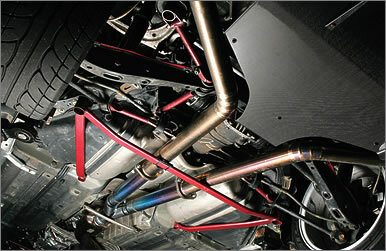 By linking these rear bars to the strut tower area, the rear suspension comes alive, enabling more traction. A rear member adaptor can be installed to increase rigidity and to prevent unnecessary suspension flex. Basically by stiffening the rear chassis area, the performance increases significantly and increases the rear tire traction. This will allow for the full use of the race tires, increasing lap times. The roll cage that was fabricated into the shop demo car has a distinct feature where the bars climb up to the pillars. The roll cages that are available on the market usually comes in a structure that connects the rear bar to the tire housing area. By adding a strut tower bar, the flex that is present will be minimized. This member adapter replaces the bushings for a direct chassis component. Be aware that the road and differential noise increases after this modification. Spot welding the frame is a technique widely used on time attack machines. First, the door hinge areas are done, and the engine bay. The EG6 is a great platform for the beginning racer since it has plenty of aftermarket parts available on the market today. First, high performance tires and suspension were installed. Next, was the rear sway bar modification. The basics theory of racing a FF vehicle is to transfer the weight to the front by braking before the corner entry. However, during cornering, the car produces lots of understeer, especially without a LSD. By installing a bigger rear sway bar, the body roll is eliminated, providing more traction. Additional support to the firewall/fenders can be applied with triangle fender reinforcement bars, boosting up the vehicle handling. On this chassis, it may not be the best to install numerous strut and floor bars. In some cases, chassis flex can actually be of some aid during cornering. So first, drive the car at a race track to determine whether or not chassis reinforcement is necessary. Then, slowly start adding on components that enhance your ability. The suspension settings should change as the driver's technique gets better. The chassis reinforcement starts there. By reinforcing the rear sway, the weight transfers to the front end of the car during cornering. Then, by adding the front triangle fender bars, the car is able to turn corners without a LSD. A 6 or 7 point roll cage is enough for a FF vehicle not equipped with a LSD. The side reinforcement beams may be too stiff for this setup. 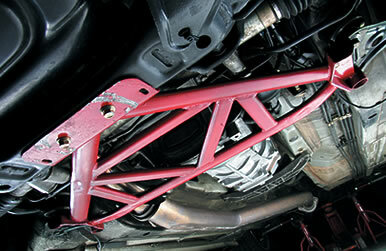 Under the upper suspension arm, there is a spot where the frame had been welded together. Inspect this area for cracks before performing any modifications. "There should be little room for chassis flex. Take care of the chassis drooping problem before the chassis flex"
At a minimum, choose a 9 point roll cage that has a diagonal and side reinforcement beams. The side bars should extend from the door area to the main hoop for a optimal 11 point setup. 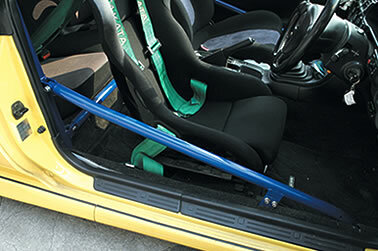 By having effective side bars on the cage, the weight transfer to the front during hard braking becomes easier. Here, the rear begins to lift, and with the use of the LSD a great cornering can be pulled off. A total tune of the vehicle should be done, from brake balance, vehicle height, and camber to achieve the best results. The front strut bar, triangle fender support, and a rear sway bar is a absolute must. But when using racing tires, be aware that too much chassis reinforcing might have negative effects. These cars actually require a little bit of chassis flex. The EK4 stock chassis bars have been removed on this vehicle to yield flex. This theory was adopted from the N1 races. Spot welding can be done as well. Rather than stiffen up the chassis like the steel bars, this absorbs the flex as a whole. An experienced driver should be able to control this aspect on a race track. A 9 point roll cage should be enough to stiffen up the entire vehicle. The stock lower tie bar should be removed for better control. Best results can be seen from a strut bar with racing tires. 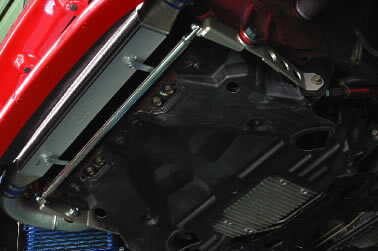 A three point strut bar that connects the struts and the firewall may have negative effects. 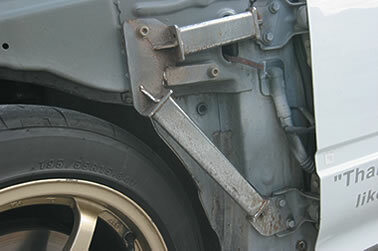 The point of a side bar is to reinforce the front and the rear of the car. While cornering, the chassis attempts to droop, but with an LSD there are no worries. 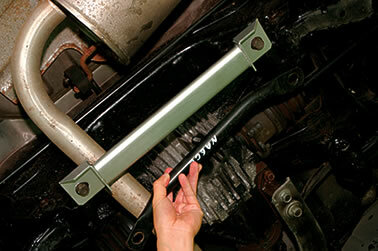 Strut bars are not recommended on some vehicles. The side sway on this vehicle is designed to keep all 4 wheels on the ground. A rear strut bar is not recommended with high grip tires. Pillar bars are included in some roll cages but they're not necessarily needed. The stiffness becomes too much t this point. The best way is to gradually add reinforcement bars one by one. In order to get the full performance out of the ACD+AYD function on a Lancer Evolution, the 4 wheels must be firmly planted to the ground. The Lancer typically is controlled by first pointing the front tires to the direction you want to o then have the drivetrain take care of the rest. However, when the rear end lifts up the front drivetrain loses its effectiveness, sending the vehicle into an understeer. But afterwards, the front drivetrain begins to kick in again, for an uncontrollable vehicle movement. This is called the reverse steer effect, and has plagued the Lancer Evolution for some time. This is where the strut bars come into play. These are absolutely necessary for these cars. The car will not even perform correctly without this component. When choosing the strut tower bar, make sure to choose one that is strong and effective; a three point one will help too. Next, the firewall should be supported by using the fender triangle bars. These bars prevent drooping of the chassis. "A lower tie bar may be good too. In the Lancer Evo's case, leave the rear alone and focus on strengthening the front. You can never go overboard on this car." 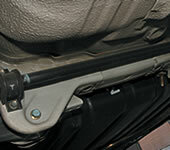 By modifying the fire wall mounting area on the strut bar, flex can be further minimized. Where the fenders have been welded, there is a crack at times. This is a high stress point and should be reinforced with a fender triangle bar. The fender triangle bars serve a great purpose whether your car is still street spec, or a full race car. These are bolt-on units and do not have to be welded. For Lancer Evolution, remove the nuts that hold one side of the strut bar. 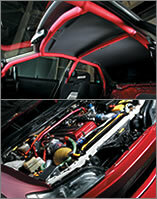 If the strut tower bar moves upward, the body needs to be strengthen. "Titanium components are the hardest". 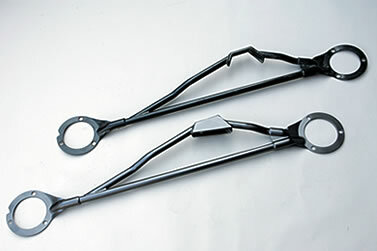 A titanium and steel strut bars are compared. The problem lots of Impreza GC or GD owners have these days is that the car won't go straight. This is a chassis flex and alignment issue. First off, the steering direction is greatly affected by the drooping/flex of the firewall. Like the Lancer Evolution, the chassis stiffening of the front end should be performed. A strut bar, triangle fender bars, and lower tie rods are all good choices. But installing these components doesn't mean that the problem is solved. "Next, the normal misalignment of the vehicle must be corrected". Saids Mr. Kuwabara from Marche. The stock Imprezas are set up in a positive camber setting to absorb the steering wheel kick back after hitting a bump. Marche had setup the camber to be negative to correct the vehicle alignment. "Side reinforcement beams and urethane injection methods should be used to fight the weakness at the A and B pillar areas." Saids Mr. Kuwabara. The height of the side bar and the main hoop arch should be set right. If its too high, it will b a pain getting in and out of the vehicle. The GD models already have the front inner fenders strengthened. On top of this, adding fender triangle bars would be better. This is the point for serious machine. On the side seals, urethane may be injected for stiffening of the chassis. This is a good modification for those who don't want a roll cage. "The front end should be stiffened for better suspension performance. The alignment should be performed relative to the chassis reinforcement modifications. Lastly, urethane injections are a must too." "The refresh bar helps the car return the chassis characteristics to new" claims Mr. Mukui from HKS. He also claims that the strut tower bars are great to use, but tying 4 points on the chassis in a square pattern creates more positive results. The final reinforcements is in the cabin space. "The roll cages sold today are good to protect the driver and passengers. The refresh bar is optional. Put the side bars on and not the fronts." This is the key point. The removable side bars and the rear bars are effective combined with the C pillar bars. The center bar aims to strengthen the B pillar bar. There might be some enthusiasts are opposed to the cabin reinforcements and would rather strengthen the chassis. When choosing chassis reinforcement parts, try to choose parts that do not hang down too low for them to hit the pavement. To reinforce the door openings, the side bars are the best choice. These side bars and the rear bars can be dismounted to carry 4 passengers in the car. The BNR34s are starting to gain high mileage these days. Titanium floor bar set and other steel sets are recommended. The front press bar connects the suspension member to both sides of the frame. This fixes the left and right lean, as well as the member misalignment. The rear press bar connects the suspension member to the propeller shaft bracket. The center brace bar supports the center tunnel. "If you can move it by hand, it needs to be strengthened" claims Mr. Mukui after explaining it to us by using the Impreza's stock subframe. Cars with hatch backs tend to be less rigid than others. The reason is because the hatchbacks provide a large opening in the rear, causing flex during G force loads. The people who race their cars at circuits should know very well about this problem. The manufacturer design is to be blamed when the body cannot keep up with high grip tires. The suspension is also affected when the body cannot keep up with the mechanisms. The suspension geometry becomes off with the reaction of the other components. The suspension feeling becomes decreased. There are also many people who complain that their vehicles are starting to creak at the door opening areas. To fight these problems, a special roll cage has been developed. This cage has trunk bars that passes through the rear trunk. With this, the car feels more like a coupe, without all the weight. This component increases the feedback of the suspension from all 4 wheels directly to the driver. The installation and removal might be painstaking, but it is definitely a worthwhile modification. Designed with a box structure for the rear hatch, the cage gives a protruded look from the body once the hatch is open. 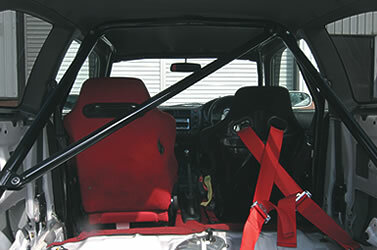 The body rigidity can dramatically be increased by installing this roll cage. 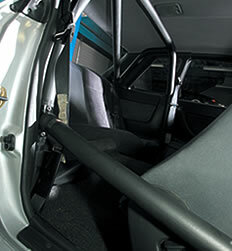 To give the full effect of the roll cage potential, the plates should be installed as secure as possible to the body. 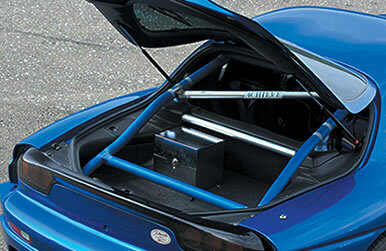 The rear strut tower bar serves as a significant component when reinforcing the chassis. This part prevents the suspension to move from static position. There are two types of features available on a 6 point cage, a through dash type, and a dash escape type. By adding a side bar, the door openings can be reinforced. "The through trunk roll cage may be pricy, but the results are well worth the money." A 4 door sedan has lots of interior space and compared to a 2 door coupe it comparatively lacks chassis rigidity. Typically, the problem with the JZX100 is that the chassis cannot be felt as one solid unit. The GOA (Global Outstanding Assessment) chassis structure on the Chaser was designed to protect the driver and passengers during vehicle collision. This design greatly affects the chassis rigidity. Takahashi from Kunny'z claims that the chassis flexes between the front clip and the cockpit, making drifting very difficult. He was plagued with this problem ever since he switched to the JZX100. The vehicle never moved the way he wanted to, always ending up understeering. This was one of the major weak factors of the car. One way of countering this problem is to make the front clip and the cabin more rigid into one piece. The suspension is greatly affected by the GOA structure as well. Takahashi decided to use bars and chassis reinforcement components to fight this problem. "By fabricating a bar that stretches from the front to the rear, the vehicle movement changed dramatically. This car moves differently than when it was stock" saids Takahashi. The rest is up to the driver's skill to make up for the negative factors of the machine. By resolving issues caused by the confliction of the vehicle manufacturer design, this JZX100 was well on its way to becoming the ultimate drift car. The brace connects the lower control arms on each side, fighting chassis flex. An extra bar was added to this unit from Okuyama inside the triangle for more strength. The Do Luck floor support bar is a must to strengthen the chassis. With this bar, the chassis moves as one, not separately. The Kunny'z rear cross bar enables precise movements during drifting. The turnbuckles are there to adjust the tension. By supporting the rain gutter present in the wheel wells, the front end entry becomes easier. By installing off the shelf aftermarket parts, positive results should be produced. "Drifting in a rigid chassis is the best feeling in the world"
Compared to the JZX100, the JZX90 has no chassis flex issues. Chassis stiffening components should be added generously, still taking into account the weight of the vehicle. Out of all the convertible cars out there, the Mazda roadster probably is the most in need of chassis stiffening reinforcement. There is no limit to this from adding a roll cage to spot welding the chassis; anything is possible. Super Private constructed this NA6CE with basic bolt-ons and high performance tires. It has been already 10 years since its release. The cars released in this generation tend to have low tire gripping characteristics because the chassis had not been strengthened at all. Even during a ride around the neighborhood, squeaks and rattles can be heard from this vehicle. The first step taken was installing a strut tower bar and a rear frame joint bar. The car's sporty feeling will revive even more after adding a rear member support bar and a front lower arm support bar. Saito, a mechanic from Super Private saids "the NA6CE chassis all have a very flimsy body, especially the first generation models. The car can become fun to drive occasionally at race tracks after stiffening the chassis with bolt-on parts". With only minor modifications, you can tell that Mazda intended this car to be driven like a sportscar. Stiffening the rear bottom area will gain the most results. If the drivetrain area is supported, the cornering speed will increase. After performing the chassis stiffening, the suspension should be set accordingly. Then the ultimate convertible FR sportscar will be born. The model received a minor change from Mazda by adding a rear member performance rod. The bar itself is flimsy, so a steel oval type was engineered for replacement. The strut tower bar is typically used to strengthen then front end. The more fatter, the better. With an additional lower arm bar installed, the overall steering will be improved. "The member cross bar is 7,140 yen. The joint bar is 8,190 yen." The roadster was changed from a 1.6 liter to 1.8 on the NA8CE models. This upgraded model also received a stiffening bar on the front also. Mazda had finally realized the necessity for chassis strengthening in the NA6CE models. The NA8CE can be further improved with the addition of the rear frame joint bar on top of the OEM bars. Mr. Mizota from Revolfe fully tuned this Z32 for a high speed Wangan setup. The chassis reinforcement and stiffening is second to none on this car. He explains "The chassis was reinforced to be able to trust the machine at high speed. The key was minimizing the flex of the flooring of the car. 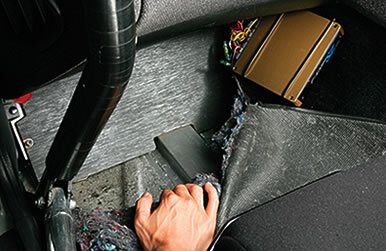 The vehicle becomes more secure during driving after stiffening the chassis." The vertical flexing of the vehicle was the cause for the unsecureness at high speeds. Mizota recommends a floor bar like the one Do Luck produces which is a complete bolt-on component. If bolting it on isn't enough, the bar can be welded on as well. However, not many companies produce Z32 chassis stiffening components because of the lack of space around the floor area. Because of this, a square shaped shaft had been welded into the cockpit flooring for this car. In addition to that, the front strut areas were stiffened up by a huge strut bar and spot welds. Now, the front tires react well with the driver and the vehicle stays stable at high speed corners. A long shaft connect front and rear is effective. 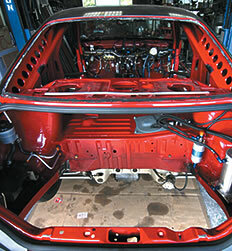 A custom roll cage made of chromoly and other elements was installed. Not only does a roll cage stiffen the chassis, but provides protection to the driver and passengers. The front strut area has been spot welded to ensure the best handling especially at high speeds. For the strut tower bar, the fatter the better. Cracking the lower part of the strut tower would be happen by racing hard with a stiff suspension. So, welding is necessary for the problem. The member and the arms stiffening is done to provide easier suspension travel. Mizota constructed this component on his own since this part is not available for a Z32. The key to creating a super stiff chassis on a heavyweight sedan is to reinforce the front and rear suspension member. As opposed to a sportscar that was designed to be raced, the heavyweight 4 door sedans were created with comfort in mind. These cars lack performance in most cases. So by just installing a suspension kit on these cars may not be enough. Still, the lack of strength in the cornering force and the suspension member causes unnecessary flex. Flex causes chassis misalignment. Misalignment causes the loss of direct vehicle control. A vicious circle like this continues. The solution is to install a component that reinforces the suspension member to the chassis. By tying these two points together with a brace, the flex becomes minimized, preventing a misalignment of the chassis. Better suspension movement is the result of this. The main frame becomes reinforced as well. On this JZS161 chassis, a Tom's suspension member brace was installed on the front and rear. This component is so effective that the suspension setting has changed after the installation. The suspension arms on these vehicles require stiffening too. TRD and Tom's offer components for these areas. The key to improving the handling on a heavyweight sedan is to reinforce the suspension areas on both front and rear. By just bracing the suspension members, the car will transform. For Toyota, this is the way to go! 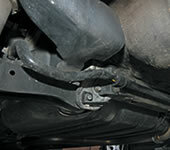 The suspension arm bolting points are reinforced along with the suspension member. This component from Tom's works wonderfully. The floor support bar increases rigidity of the vertical flex. These are a must have on a 4 door sedan, improving the suspension movement by 120%! Do Luck's rear cross bar is installed between the strut tower in the middle of the chassis. This item works great with a floor support bar. "There are no downsides to increasing chassis rigidity." Claims Mizota. He is a chassis strengthening expert.